Back in 2008, soon after this site started, we had a short run of t-shirts made to show off our then new Public Enemy inspired logo. Over five years later, we are still here and wanted to celebrate by updating that classic tee. 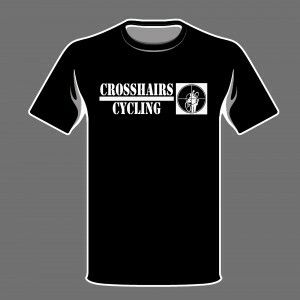 So check out the new Crosshairs Cycling shirt and bring the noise. If you want, you can also bum rush the show (Yo!). Just please wear a helmet if you do. All of the shirts, socks, and other items sold help us bring to you bike racing coverage from Cross Vegas to SVENNESS and LIKEAVOS. Sales of this shirt are no different. The goal is to be around for a long time. And with your help, that will happen. As always, thank you for your support, it means everything. We will place the order June 2 with a targeted ship date around June 15.